4 bedrooms, 2.5 bathrooms, sleeps 11. This extraordinary home is BEAUTIFUL and LARGE. Plenty of room for everyone. Three levels offer 4 bedrooms/2.5 baths. The living room features a beautiful fireplace (wood not provided), satellite tv, DVD, stereo and telephone. Sit on the deck off the living room and enjoy the beautiful Pine trees while cooking on the gas BBQ. The kitchen offers amenities such as; microwave, coffee maker, blender, toaster and more. The upstairs master bedroom has a king size bed and private bath, while 3 additional bedrooms can be found downstairs consisting of 1 queen bed and private bathroom, 2 queen size beds and a third bedroom with 1 queen and 1 twin. Washer and dryer on site. A definite must stay to enjoy. 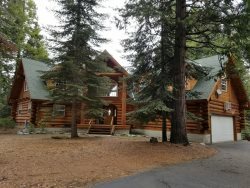 Walk to all the shops and restaurants that are offered in the quaint Village of Shaver and just minutes to the Lake. No Pets. Approx 2,090 sq ft. 2 night minimum HOLIDAY'S WILL REQUIRE A 3-4 NIGHT MIN.STAY. Stairs and driveway can get icy. Please be cautious during winter.